Grades 6 to 12 Roll These Dice Grades 5 to 10 Is a Square a Rectangle? Can you explain why the centre of square -1 is (-4 ; 0)? What are the coordinates of the centre of square number -10? Explain how you can find the coordinates of the vertices of square 2? 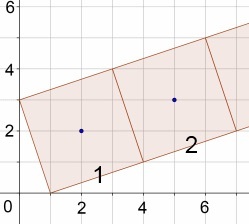 Now the big challenge: explain how you can find the coordinates of the vertices of square n? The ideas for this problem originally came from the SMP11-16 booklets on Coordinate Patterns published by CUP. I think this would be a good activity to give to the learners to do in the beginning of a patterns lesson,but it requires that they are already familiar with the co-ordinate geometry as well as transformation geometry. The learners would be aware of what coordinates are and what a pattern is.there may be a need to revise number systems with a special focus on integers. 1. Write down coordinates of square centres 2 to 4. 2. Tell if they see any pattern with the x-coordinates as one goes up. 3. Tell if they see any pattern with the y-coordinates as you goes up. Then,I would ask different pairs to write coordinates for further square centres. Now that sounds like there’s some proportion there,is it direct or indirect? To use this type of activity,prior knowledge of co-ordinates is going to be vital.This might mean u will have to give them an activity to determine how much they know before u give them this one.Remember even at grade 12 level learners are still faced with the challenges of lack of the basic mathematical knowledge. I would decide on the topic and its objectives for that particular period. Topic : Coordinates – Objectives : identify x and y coordinates. Activity : On patterns, identification of coordinates on the cartesian plane. The challenge with problem 2 is counting to the left coming with negative pattern. Learners are used to counting terms starting from one. The learners might not know that negative is just a direction. The prior knowledge must be on direction and a link with physical sciences. Much time should be spent on focusing on a direction. This is a good activity to get students thinking about quite a lot of things combined. Squares, coordinates,patterns and gradients. This is a beautiful way of introducing learners to patterns. In this problem the learners prior knowledge of coordinates are revised. The learners will be faced with two types of patterns, the x and the y values. After identifying the general term for both the x and the y value, the learners should be able to solve the problems. The learners will have problems in identifying with negative terms(where eg. this is the -3rd term) as we teach learners that the number of terms cannot be negative. One way of looking at this problem is by finding the defining equation of all the points that are in the centers of theses squares. then one can find the the center of the 20-th square. 1. Explain to the learners the topic, objectives, and evaluation. 2. Allow learners to represent the squares on their geoboards in both directions, i.e. right and left. (if geoboards are not big enough, they can use square dot papers for the same exercise. 3. Allow learners to write coordinate corresponding to the x-valuse on the Cartesian plane. 3. Let them discuss the relationship they observe, when going towards the right, or moving to the left, and the same for up and down. 4. Ask them to find the correct coordinates using their discovered rule, after analysing their own squares. 5. Explain to them that since when we talk of terms, we always refer to counting numbers, going to the left simply means counting too, but in the opposite direction. 6. I would then allow them to experiment using their self-created squares. This activity encourages students to visualize arithmetic sequences in a more simpler and practical way. This activity is a good example of integration sections with the subject content because it integrate coordinate geometry and number patterns in one lesson. 1) Ask your learners to determine the coordinate of the center of any square from the given sequence of squares, at first. 2)Ask them to determine the coordinates of the vertices of the square they managed to determine the center from number 1. 3) Use analytically method to determine the midpoint. 4) Use the know of number pattern to determine the term number 18 if the squares are placed in the same order continually. The learners must do the activity using their logical thinking skills. Prior knowledge must be taken into consideration. The learners must know the x-axis and y-axis. In this activity learners need to have a good understanding of how to plot the points in a Cartesian plane as well as to be able to see the scale of the grid.I think learners if they can generate the formula to work this, will be of great advantage to them so that they will be able to calculate the co ordinates of the centre of any number of terms.But there is still a problem with the learners, are not motivated when they do their work if I can have an idea of how to motivate the learners I think that will be of great appreciation from my side. i enjoyed learning about this number pattern .I never thought of before I had only examples taken from Algebra.